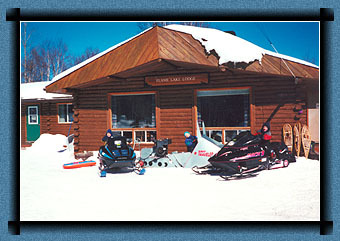 Flame Lake Lodge is located on Tops Trail F, 60 miles (100 km) south of Chapleau and 115 miles (180 km) north of Elliot Lake. 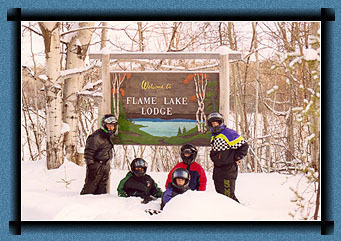 We offer homemade lunches and have a terrific overnight package including dinner and breakfast. There are also lots of trails and back roads on Crown land to explore if you like to get off the groomed trails. 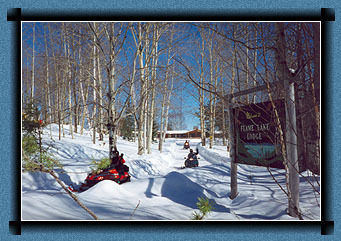 You can also snowmobile to some great ice fishing lakes or you can just ride around and enjoy the quiet serenity and beauty of winter in northern Ontario's boreal forest. Please Note: We no longer sell gasoline. Sorry for the inconvenience.